In the Jewish tradition, Shabbat dinner marks the beginning of the Jewish Shabbat, or day of rest. Shabbat is marked by two things in my family - lighting of candles, Challah and a family dinner. I often make my Challah at other points during the weekend as well, but tonight we had a Shabbat dinner consisting of Veal Marsala (which will be the subject of a future post). 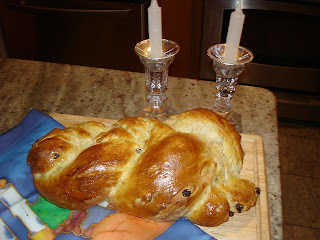 When we lit the candles, we did so using my home baked Challah. Usually, I simply prepare a regular Challah, according to Martha Stewart's recipe in her Baking Handbook . 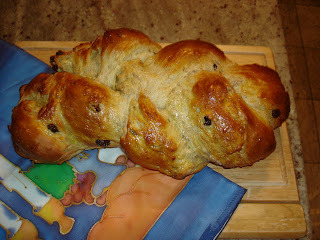 I already wrote about how I prepare Challah in an earlier post when I first started this blog. Tonight, I decided to rework the original recipe to make a Cinnamon Raison Challah for Shabbat, which is consistent with the sweetness that Jews have always associated with this weekly day of rest. First, preheat the oven to 200 degrees. When the oven is heated, turn it off. Heating the oven a bit and then turning it off will provide a warm place for the dough to rise. I used to dismiss doing it this way, but the Challah rises faster and better if this advice is heeded. In a small bowl, mix the dry active yeast, cup of warm water and sugar. Allow to sit for 10-15 minutes for the yeast to activate. It should become foamy and frothy. If it does not, then it did not activate and you must start again, or your dough will not rise. 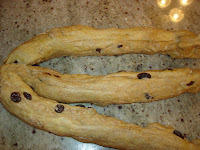 Mix the flour, salt, cinnamon and raisins in a large mixing bowl. Put these ingredients in the basin of an artisan mixer, and add the 8 egg yolks, carefully separating the yolks from the whites. Add the honey, activated yeast/sugar mixture and oil. Mix until it forms a dough in the mixer. Place in a well-oiled bowl (grease with Pam or Canola Oil). Then place the bowl, covered with a towel, in a warm place, as discussed above. Allow to rise for about 1 hour, until it doubles in size. Then divide into two balls. Divide each ball into three strands, and pinch at one end. 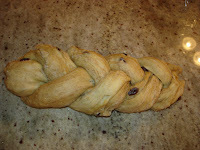 Braid into a Challah. Don't worry that the Challot each look small - they will be rising for an hour, at which point each Challah will be quite sizeable. But if you don't trust me on this one, feel free to make one Challah - a ginormous Challah, indeed. Put the two braided Challot on baking sheets, and cover with plastic wrap and allow to rise for another hour in a warm place. They will get significantly larger during this period, as they continue to rise. Then glaze each with an egg wash, and bake in an oven preheated to 375 degrees F for about 30 minutes, until golden brown. Monitor this step carefully - depending on the size of your Challah the baking time may vary a bit. Sweet cinnamon raison Challah is the perfect way to close out the week, and prepare for a sweeter week ahead. 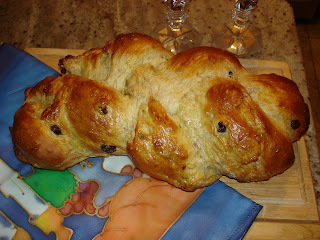 The end result here was my softest, lightest Challah to date - perhaps my best yet (although I say that every time). We ate it while it was warm, fresh out of the oven, after lighting candles. This is the way Challah is meant to be served.